The Architect's Newspaper Blog (A|N Blog) gives insight into the community of architects, designers, engineers, landscape architects, interior designers, and really anyone that has an interest in the built urban environment. The site provides quality news and cultural reporting through multiple voices and offers different opinions on popular topics. A recent post unveils a new Sanaa Meanders design which is part building, part art installation. 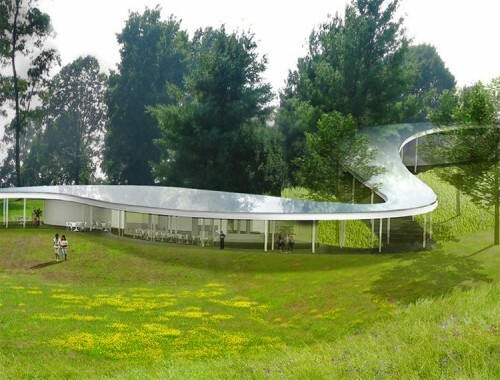 The Tokyo-based SANAA designed what they call, "The River for the Grace Farms Foundation" which is located in New Canaan, Connecticut. The building meanders through one acre of the 75 acre site, and is defined by the flowing roof which is only ten feet above the OLIN designed landscape on slender metal posts. The interior spaces of the building are formed through winding the structural portion of the building. The enclosed spaces are encased in floor-to-ceiling glass which allows for the transition from interior to exterior to be blurred. Have you heard that there could be a new urban farm on the roof of a 200,000 square foot farm in the Bronx? Urban agricululture is the focus of another post. 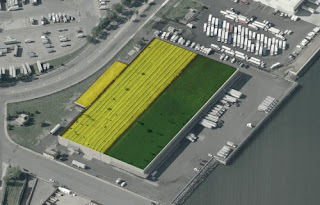 The Bronx already plans for other rooftop farms, but this would be the largest project ever done, in fact it would be the largest rooftop farm in the world! The blog also posts competitions with ample time for you to start thinking and come up with a winning design.The Architect's Newspaper is also a print magazine so think about subscribing and never missing out on interesting articles. So go onto the site and start reading!